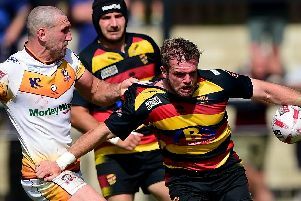 Doncaster Knights may have lost the battle at Castle Park on Saturday but they can still win the war. That’s the view of director of rugby Clive Griffiths after reflecting on the club’s 22-5 defeat against runaway leaders London Irish in the final Championship game of the season and looking ahead to the two play-off semi-final ties against the Exiles. “It’s a trilogy if you like; they won the first one and we’ve got to try and win the next two,” he said. “We know we will have to play better in the play-off games, when we’ll have a couple of players back, but we’ve shown that we can break their defence and they’ll know they can’t afford to treat us lightly,” he said. “Obviously we’ve lessons to learn from Saturday. “We squandered possession in the first half and kept making handling mistakes similar to those in the defeat at (Cornish) Pirates. “I’d have been disappointed if we hadn’t have scored because that would have been two games against them this season where we hadn’t scored so it was important we did. “We knew they were very good defensively, but, as I say, we did create a number of good chances and that was pleasing. “I also think we defended well for most of the game – particularly in the first half when our defence was heroic at times. “The two tries either side of half-time put us on the back foot and realistically it was all over when they scored again while we were down to 14 men.